The use of clear, concise and unambiguous terminology is essential in conveying scientific information. Nowhere is this more important than in chemistry, where most studies adopt the approach of defining a chemical species, with the corresponding structure, and then proceed to investigate reactivity and/or other intrinsic properties of these species. Chemical nomenclature strives to make the process of definition straightforward, and at the same time it aims to key the results to the literature, by means of a terminology that is based on systematic ordering and naming of functional groups. By and large, the chemical naming system (as recognized by IUPAC) works well. Eventually, however, any system reaches its limits, as we have found in the relatively new literature associated with room-temperature ionic liquids. While the procedure for naming individual ionic liquids is essentially straightforward (involving a simple combination of cation name with anion name), it happens that one of the anions that is frequently used is one that also challenges the utility of the current naming system as there is no clearly acceptable systematic name. The anion, [(CF3SO2)2N]-, is shown together with its parent protonated form in Figure 1. Figure 1. a) the commercial acid trifluoromethanesulfonimide b) its anion. The functional groups pertinent to this discussion are presented in Figure 2. The imide nomenclature extends the analogy between amide and sulfonamide (IUPAC approved) to imide and sulfonimide (or sulfonyl imide) of which only imide is recognized. The symmetry of the molecule also allows commercial suppliers to abbreviate the name to trifluoromethanesulfonimide (CAS number 82113-65-3). Figure 2. 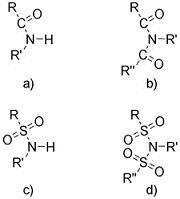 The general form of the functional groups: a) amide, b) imide, c) sulfonamide, d) sulfonimide (sulfonyl imide). In now seeking to name the anion (Figure 1b), inspection of the literature shows that most authors have been guided by the imide (non-systematic) naming of the parent acid, and have in fact used the imide designation for the anion. This scheme, based on the general use of the -ide suffix to designate negatively charged ionic species, of course gives rise to the inherently confusing situation where both acid and anion (Figures 1a and b) are assigned the same name, with the distinction being based on the chemical context in which the name is used. In addition, the use of trivial names such as bistriflamide3a and triflimide3b have been used obviously due to structural similarities to the anion CF3SO3-, commonly referred to as triflate. However, in the IUPAC Nomenclature of Organic Compounds (the “Blue Book”) and in the revised provisional recommendations, the now-accepted naming is as an “amide,” and it is useful to examine the reasoning that might be used in support of this system. As an amine, there is also recognition of the symmetry of the compound. In the case of the simplest amine, ammonia (Figure 3a), removal of a hydrogen ion (hydron) produces the singly charged anion, NH2-, amide (Figure 3b). Removal of a second hydron produces HN2-, imide (Figure 3c). By analogy, the terms amide and imide are allowed for general nomenclature of species such as R2N- and RN2-. Thus, Figure 1a depicts a secondary amine in which the trifluoromethanesulfonyl groups are regarded simply as “side-groups,” which make no contribution to the functionality that is incorporated into the naming. Accordingly, the anion of Figure 1b is clearly an amide, bis(trifluoromethanesulfonyl)amide—commonly abbreviated to TFSA. A name based on “imide” is not even optional, as imides are, according to this scheme, doubly charged, and can only be derived (practically) from primary amines. Figure 3. Ion formation by loss of hydrogen from a) ammonia, to give: b) amide; c) imide. Arguably, the amine–amide naming scheme is an improvement on the imide-imide scheme, as it removes confusion over which species (neutral parent or anion) is being referred to. However, the latter is entrenched in the literature, having taken its place when metal salts of the perfluoroalkanesulfonyl superacids became known as useful reagents.5 Further, as already noted, both amide and imide are embedded in the organic literature as chemically distinct, though similar looking, functionalities. It is probably a combination of all these factors that now sees the literature, particularly that pertaining to ionic liquids, exhibiting a fair degree of confusion in the naming of the TFSA/I anion. Thus, the anion of Figure 1b would have the systematic name of bis(trifluoromethanesulfonyl)azanide,which could still be abbreviated to TFSA. The next member in the series of fluoroalkanesulfonyl anions, shown in Figure 4, would have the systematic name of bis(pentafluoroethanesulfonyl)azanide, abbreviated to PFSA. Until now, the chemical literature has referred to the latter (apparently without exception) as BETI—bis-(perfluoroethylsulfonyl)imide.8 Here, it seems that the naming scheme followed was designed more to produce the acronym than to stabilize an unsteady aspect of chemical nomenclature. As far as we can determine, no one has attempted to name this anion as an amide. Figure 4. The anion widely known as BETI—bis (perfluoro-ethylsulfonyl) imide. One of the factors that has contributed to the uncertainty over the naming of TFSA is limitations in the scope of existing IUPAC rules on nomenclature. There are several functional groups for which the formation of ions has not been considered in detail. An example that illustrates the limitations is the so-called organic acids, where IUPAC only recognizes those where the acidic group is based on a chalcogen atom, and then derives the anion name based on the name of the parent acid. In the present case, however, the anion name that we are directed to use (azanide) is really a broad descriptor (signifying “nitrogen-centred singly-charged anion”) which bears no specific link to the protonated form. Ultimately, we suggest that a more satisfactory naming should be sought for HTFSA and TFSA-. This will first require official recognition of the sulfonyl imide (sulfonimide) functionality, to mirror the already-accepted sulfonamide. Given that the former are all strong acids, and that their conjugate base anions now constitute an important chemical class, it follows that naming of the anions should be linked to that of the parent compounds, as it is for other acid-anion pairs (vide supra). Thus, the search should continue for a chemically appropriate, unambiguous way of naming the anionic form of the (putative) sulfonyl imide. To this end, a possible solution can be found in the literature on these compounds. In a 1990 patent,9 Michel Armand, one of the pioneers in putting TFSA salts to work as electrolytes, labelled this group of anions as “imidides”—literally, anions of imides. Perhaps current agreement on TFSA(azanide) will be a transient on the way to acceptance of TFSI(imidide). † It is also possible to name the anion an aminide, since IUPAC recognizes this for anions derived from amines. However, as discussed, the status of the protonated form as a true amine is questionable. For anions derived from amides, IUPAC recommends the use of azanide. 2. J. Foropoulos and D.D. DesMarteau, Inorg. Chem., 1984, 23, 3720–3723. 3. a) M.J. Earle, U. Hakala, B.J. McAuley, M. Nieuwenhuyzen, A. Ramani, K.R. Seddon, Chem. Commun., 2004, 1368–1369. b) K. Dhanalakshmi, M. Vaultier, Tetrahedron, 2003, 59, 9907–9911. 4. A. Haas, Ch. Klare, P. Betz, J. Bruckmann, C. Krüger, Y.-H. Tsay and F. Aubke, Inorg. Chem. 1996, 35, 1918–1925. 5. See, for example, K. Mikami, O. Kotera, Y. Motoyama, H. Sakaguchi and M. Maruta, Synlett, 1996, 171–172. 6. IUPAC Provisional Recommendations, Preferred IUPAC Nomenclature, September 2004. 7. a) Chatt, J. Pure Appl. Chem. 1982, 54, 2545–2552. b) Nomenclature of Inorganic Chemistry: IUPAC Recommendations 2005, ed by N.G. Connelly et al. The Royal Society of Chemistry, 2005. 8. C.G. Barlow, Electrochem., Solid State Lett., 1999, 2, 362–364. 9. a) M. Armand, World Patent WO 90/03968. b) see also, M. Armand, M. Gauthier, C. Michot and N. Ravet, World Patent WO 99/40025. Gregory J. Wilson <Greg.Wilson@csiro.au> and co-author are working at Energy Storage Technologies, CSIRO Energy Technology, in Clayton South, Australia. The editor thanks the authors for their contribution to CI, and notes that their recommendation does not imply in any way official acceptance by IUPAC. The whole subject of organic nomenclature is currently under revision and will result in a new edition of Nomenclature of Organic Chemistry (the “Blue Book”). As Wilson and co-authors point out, current nomenclature does allow for unambiguous names for the species presented in Figure 1, and such problems arise when one wants a system of unique (preferred) names. This complex problem has been worked on by IUPAC project task groups for some time, and new recommendations can be expected in a year or so. See relevant IUPAC project <www.iupac.org/projects/2001/2001-043-1-800.html>. Page last modified 26 July 2007.